Play Wheel of Fortune Now! 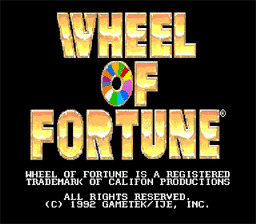 It's the hit game-show that's been on several TV channels since 1975, it's America's game; WHEEL....OF....FORTUNE! If you don't know about the great game-show Wheel of Fortune, I'd say you were born before the primitive life began. So if you haven't seen the game-show, do so. Once you've seen it, come back and hit the "Play Now" button. Trust me, you'll want to see the game-show before you come back and play this. Wheel of Fortune is divided into rounds. Each round, there's a puzzle. Characters take turns spinning the wheel and choosing letters to solve the puzzle and win money and prizes. Prizes include trips, cars, jewelry and money. However, there are things on the wheel that can cause your money boat to sink: the lose-a-turn, and the dreaded bankrupt. The person with the most money after the game wins and plays a bonus round. The bonus round gives you the letters R,S,T,L,N,E and 3 consonants and one vowel of your choice.